The Netherlands comfortably won the first leg of the European Trophy and look comfortable favourites to bounce straight back to the Grand Prix in 2019. 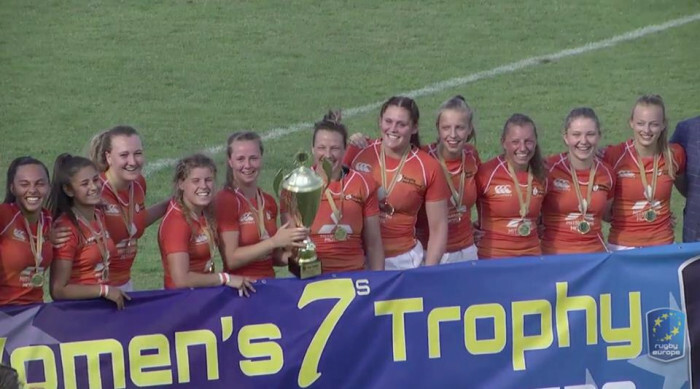 After comfortably winning their pool, the Netherlands stormed through the second day, winning all of the knockout games without conceding a point. As second seeds (because of their 12th place in last year’s Grand Prix) the Dutch were drawn in Pool B where they won all of their games with relative ease, although the Czechs went into an early lead in the final round of fixtures (aided by a Dutch yellow card). A 57-0 quarter-final win over Finland and a 33-0 win over the impressive Romanians put them in the final with the hosts, Ukraine. The hosts had had a mixed tournament, looking good on Day 1 before losing the final match of the day to Romania. They bounced back on Day 2 with big win over Switzerland (39-0) in the quarters before shocking the pre-tournament favourites, Sweden, in a semi-final where the Swedes had almost all of the possession but were frustrated by strong Ukrainian defence, the home team winning 17-12. The final was a more one-sided affair, Netherlands winning 33-0. Sweden narrowly won the crucial bronze medal match against Romania to set up a likely repeat semi-final with the Ukrainians in the second leg which could decide who gets promoted alongside the Dutch, who on this performance are racing certainties. These three plus Romania were significantly stronger than the rest of the line-up. Latvia are in poll position for relegation, having been well beaten 31-0 by Israel in the 12th place game. The Israelis have an outside chance of avoiding the drop if they can get past Austria, who looked good at times but finished 10th with only a big win over Latvia to show for their efforts. The surprise team of the weekend was newly promoted Norway who finished an impressive 7th after beating Finland on Day 2 and the Czechs on the Day 1. The Czechs also surprised by losing all of their pool games but recovered on the second day to easily win the Challenge. They should comfortably avoid relegation. Hungary also impressed for the second year with an overall fifth place.